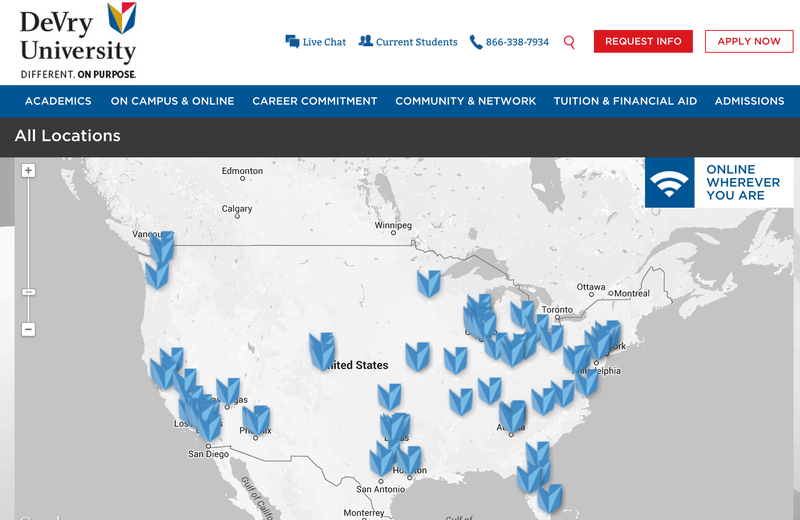 DeVry is shuttering 14 campuses in 11 states, and moving those students online. Amid lawsuits, scandals, shutdowns — not to mention the many former students who say they racked up huge student loan bills without getting an adequate education — enrollment at for-profit colleges in the U.S. continues to shrink. And students at 14 DeVry campuses in 11 cities will soon have to take their education online with the educator moving those schools online in an effort to save money. DeVry Education Group has unveiled its latest quarterly earnings [PDF], and things have been better for the for-profit college operator. New undergraduate enrollment in March at DeVry University was down 17.2%, with overall undergraduate enrollment down 15% over last year, a total drop of more than 6,000 students. The company’s Keller Graduate School of Management also saw a drop (-9.5%) in enrollment over the same term in 2014. Likewise, DeVry-owned Carrington College saw modest declines in enrollment, with 2.7% fewer new students and a 1.5% decrease in overall enrollment. Interestingly, DeVry is seeing a boom in student growth in Brazil, where its DeVry Brasil operations grew by 78% over last year, from 33,000 students to nearly 59,000. DeVry Brasil now represents the largest single chunk of DeVry’s 144,000 students among all its schools. As part of the its turnaround plan, the company is shuttering more than a dozen physical locations across the country. Students at these schools will have to take their coursework online, but DeVry hopes the savings in property and staff will offset the declines in enrollment.